Showing results for tags 'loyalty'. COME JOIN OUR ALLIANCE!!! We are a newer Alliance. We are looking for members that want to participate and be active. All ideas and thoughts are welcome. All we ask is that you is that you compete and fight in every war. If you can't for some reason, just let the admins know that you will be busy for however many days. We are very understanding. Active members to the group will be promoted more regularly. We believe in Loyalty. If you are interested feel free to join! Phoenix Corporation would love to have you. Mortal Legend V- Strong and Active- Seeking loyal kings. We are all bloodthirsty maniacs who just want to see our enemies suffer, but we are all friendly (to each other at least) and have a great time playing this game together! Alliance name: Mortal Legend V Alliance level: 17 Alliance languages: English, French Motto: "Alone we are mere mortals. Together we can become immortal legends!" Goal: We want to grow to be as strong as we possibly can. This will be done with loyal allies who become our friends. War History: We are a relatively new alliance, but we are growing in strength and size quickly! Against all odds we are victorious in battle! Acute Archery- 1st place- +4 Fiefdoms Rotten Times- 1st place- +5 Fiefdoms Vault Assault- 2nd place- +2 Fiefdoms (against much stronger opponents) Savage Struggle- 1st place- +4 Fiefdoms Blazing Inferno- 2nd place- +2 Fiefdoms (against much stronger opponents) Recruitment Requirements: Exceptions can be made on a case by case basis. Players must remain active by participating in wars.- If you won't fight for us when we need your help, then we don't want you. Players must donate daily.- Donations allow us to finance wars and boosts, and this is how our alliance will grow. Players must show respect to each other.- We want to form close bonds that inspire friendship and loyalty. Trophies- 1500+ Donation- 50k+ or the intention to upgrade to at least this level. How to apply: Please post the following information. You can look us up in game and join, but we will kick you if you don't meet our requirements. King's Name King's Level Current Trophies Current Donation Amount Language Spoken Come have some fun with us, and we'll become legends together! Hi everybody, I am pleased to introduce our alliance "Marsupia" We stand for the principle that Royal Revolt is just a game. People are more important than game-gold and more important than +/-% gold. We stand for Friendship, Loyalty and Integrity Marsupia is a multi-national alliance and we have members from all over the world. Our members are active on the chat and we share a lot of useful information. English is the main language for all, but we speak other languages as well: German, French, Spanish, Thai and Russian. Marsupia is a very friendly alliance and our members help each other with advice and even fight for each other if someone is harrassed by a certain player, who is much stronger than him. Let everybody know not to mess with our alliance or with our members. I have a personal facebook account and all our members are invited to join. We don't encourage our members to spend real money for donations. everybody donates by his abilities. Keep your money for the real life... Still, if a member decides to make a special contribution, he is always welcome. From the moment a member joins us, he is safe with the alliance, even if he has a low rank/level. Members are never kicked out, unless: 1. They don't donate at all for a long time. 2. They don't participate in the alliance wars, while being online. 3. They become inactive. 4. Offensive behaviour or cheating. Anyone is free to accept invitations from other alliances and even to discuss it on the chat... If a member updates us that he will be out of the game for some time, but he plans to come back shortly, he will not be kicked out, even if he becomes inactive. Members who have become inactive in the past, are monitored all the time. If they become active again, they are always welcomed back, regardless of their rank/level. I consider myself more administrator than a Leader. I stand for democracy in the alliance. All the big decisions are made together and discussed by the members on the chat and every member's opinion is important and heard. 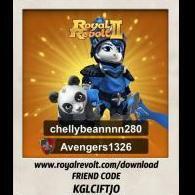 All the players in Royal Revolt are invited to apply to join us. We welcome all. Good luck.